Dear reader we know raft foundation is a combined foundation which accommodates structural loading from different member, like column, shear wall etc. and transfer them safely to bearing formation. 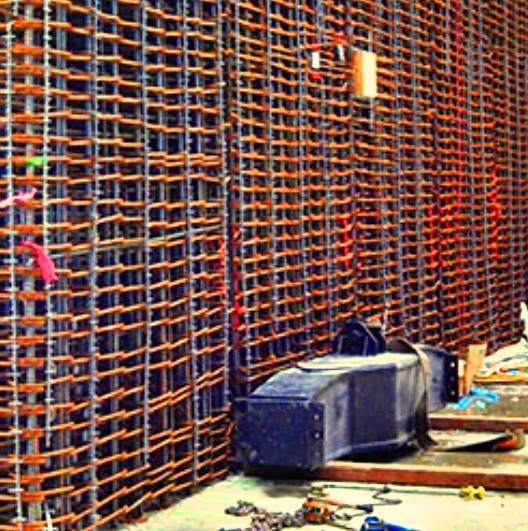 With many advantages, raft foundation can accommodate large eccentric loading. The foundation can be designed as rigid foundation slab or following flexible approach. Different approach and methods of analysis and design of raft foundation has been developed; like other combined footing, considering eccentricity, the geometric center of this foundation is determined. Some design examples will be published in this blog very soon. Now consider a isolated footing, subjected to loading with large eccentricity- this have susceptibility to exert excessive stress on foundation soil beyond safe bearing pressure or too much differential settlement or suffer to much footing rotation. This situation can be arisen in dual system (have shear walls and columns) where shear walls are designed to transfer major portion of horizontal loads to footings. In high-rise buildings, shear wall or core wall is very essential to cope with large horizontal loading from wind and earthquake. The concepts of tall buildings are mainly based on different arrangement of shear wall and columns, except tube structure. Even in tube structures have several multiple tubes and core walls to have more lateral capacity. When these shear wall in supported on individual footing, their rotation becomes excessive and if raft foundation or other deep foundations are no introduced, the shear wall becomes ineffective. In some cases, where subsoil condition is not satisfactory, piles are introduced which supports raft or mat; but their raft is important not to reduce differential settlement but for the purpose of basement. The raft foundation offers there water tight basement floor. So there have no well defined rules to define where to provide raft foundation. So the foundation engineer have to choose foundation type, that is practical, economical, safe and stable considering local condition and serve construction purpose. So foundation design is considered as art rather than pure science.